VA Governor Terry McAuliffe tonight awarded the 2014 Virginia Wineries Association’s Governor’s Cup to The Williamsburg Winery’s 2010 Adagio, a blended red wine. Speaking at the Governor’s Cup awards ceremony, Governor McAuliffe said, “I am honored to award the Governor’s Cup to The Williamsburg Winery, one of Virginia’s oldest and most prolific wineries. It is no secret the Commonwealth’s wine industry has experienced tremendous growth both in quantity and quality in recent years. Such growth has an enormous impact on Virginia in terms of economic development and job creation. The Virginia Governor’s Cup, now recognized as one of the nation’s most stringent competitions, helps to raise awareness of the world class wines grown and blended right here in the Commonwealth. My congratulations to The Williamsburg Winery for their long history of success and their most recent notable contribution to the Virginia wine industry." The Williamsburg Winery’s Adagio is a blend of 42% Cabernet Franc, 30% Merlot and 28% Petit Verdot. Aged in French, American and Hungarian Oak, the ratio is 43% new oak, 14% one year old oak; 29% two year old oak; and 14% three year old oak. The winemaker’s tasting notes are as follows: The 2010 Adagio is a very bold upfront wine with loads of jammy fruit. The blackberries and blueberry notes are accentuated with some elegant mature darker fruit such as figs, dates and prunes. There is a hint of spice (warm cinnamon) with molasses and soy. The earthy notes come across with a touch of nuttiness. The oak is very integrated into the weight of the wine and the tannins are smooth and graceful. The wine has a wonderful finish that lasts for quite awhile. "It is very satisfying and very humbling to be with my peers and the others who have won the Governor’s Cup. The 2010 Adagio was unbelievable, exceeding all expectations for quality, and it was nice for Adagio to get that recognition,” said Matthew Meyer, vice president and winemaker of The Williamsburg Winery. "Adagio, from the Italian ad agio, or ‘at ease’, is a musical term indicating the tempo of a composition that is meant to be slow and stately, so named in honor of the extraordinary depth, elegance and grace of this wine." The 2014 Virginia Governor’s Cup Competition was conducted over three weeks of preliminary tastings, held at the Capital Wine School in Washington, D.C. The final round of tastings was held at the Jefferson Hotel in Richmond in early February. The Governor’s Cup award winner was selected from the 2014 Governor’s Cup Case. The top 12 scoring wines of the competition, The Governor’s Cup Case, were selected from 410 entries of both red and white wines, from 96 wineries. The Williamsburg Winery is located on Wessex Hundred, a 300-acre farm located in Virginia’s Historic Triangle. The winery has experienced continuous growth through an expanding portfolio of wines. The introduction of the 2007 Adagio was the culmination of a single-minded goal to produce the highest quality wines in the world. This is the second Governor’s Cup for Williamsburg Winery. The winery won in 1989 for its 1988 Chardonnay. "Winning the Governor’s Cup is a testament to Matthew’s talent and to the dedication of our entire team, whose focus is on excellence in wines made 100% from Virginia grapes. Our goal is to grow as a leader in the industry, developing wines that reflect the character of our Commonwealth, neither Californian or European, but displaying elegance and interesting flavors," said Patrick Duffeler, president and CEO, The Williamsburg Winery. In addition to awarding Williamsburg Winery’s 2010 Adagio the 2014 Governor’s Cup, Secretary of Agriculture and Forestry Todd Haymore was named Wine Person of the Year for his contributions to this rapidly growing sector of the Commonwealth’s economy. Sales of Virginia wine reached a record high in fiscal year 2013 with more than 511,000 cases, or more than 6.1 million bottles, sold. Virginia currently ranks fifth in the number of wineries in the nation with 250 wineries. Virginia is also tied with Texas as the nation’s fifth largest wine grape producing state. According to a recently released economic impact study, the Virginia wine industry employs more than 4,700 people and contributes almost $750 million to the Commonwealth’s economy on an annual basis. 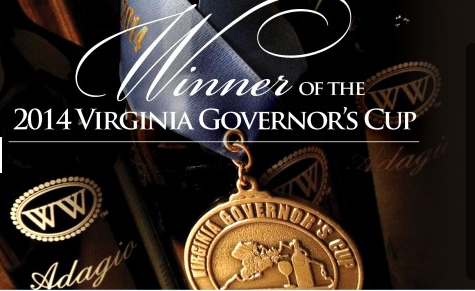 For a complete list of previous Governor’s Cup winners and information about the Virginia wine industry, please visit the Virginia Wine Marketing Office http://www.virginiawine.org/governors-cup/awards/ or call 804-344-8200.